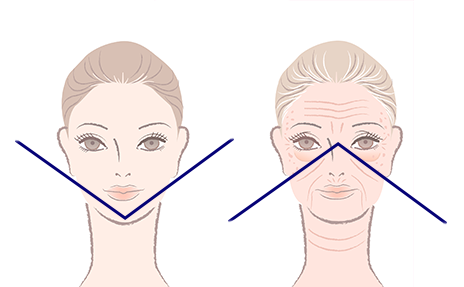 The youthful triangle descends and seemingly stands on its head due to the aging process of our skin. The quality of the skin decreases as collagen, elastin, and hyaluronic acid break down and decline in number. No longer supported from within, the skin becomes thinner and eventually gives way to gravity as the cheeks slide downward. The base of the triangle is now defined by sagging jowls and a fuller jawline. We are excited to introduce NovaThreads to our Manhattan, Brooklyn, and Westchester offices. With NovaThreads, Dr. Karlinsky is able to delicately lift and reposition the skin to recreate a youthful V shape. NovaThreads take your face from a tired, oblong shape with slack contour to taut and shapely with clear, defined contours. NovaThreads are pre-loaded needles that contain polydioxanone (PDO) sutures. Synthetic and absorbable, PDO sutures are one of the safest materials for implantation within the body. During the four to six months needed to fully absorb the PDO suture, your body is repairing itself around the suture—encouraging new collagen production and making for long-lasting results. NovaThreads are a great addition to New Look New Life’s line-up of minimally-invasive treatments for facial rejuvenation. With NovaThreads, you can achieve a naturally youthful appearance without the need for surgery or downtime. To learn more, please schedule a consultation at one of our New York City area locations.